Welcome to October’s completely unbiased (as always) roundup of my absolute favourite grooming and skincare products. This month has seen a big difference to my hair styling and hair care collection, I think you’ll be impressed with an eclectic mix of mass and prestige from all over the place. Enjoy. 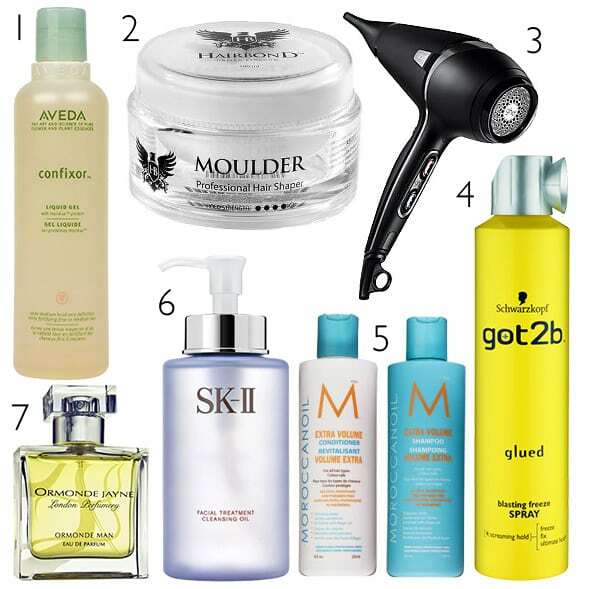 In first place, the Aveda Confixor Liquid Gel. A-mazing. I’ve always had hair that I’ve found difficult to manage and that never particular stays in style, well, until now that is. Applying only a very small amount into towel dried hair really causes your style to stay which becomes immediately visible as you begin to blow dry your style. It smells great with the classic Aveda blend of flower and plant extracts, and because it’s Aveda, you know this stuff is good. You can pick it up at John Lewis here. I really can’t say more than I have done in the past, but the Hairbond Moulder is my new favourite, replacing the distorter as my hair style has actually changed which needs a tougher yet more flexible hold. It smells great and is another unbelievable creation from the Hairbond Labs and Scott Michaels, a man I’ve come to really respect through his fabulous business, astounding products and un-greedy price tags. You can pick this up at Mankind here. I was sceptical before trying as I never really thought a hair dryer could be all that different from model to model, brand to brand. What an idiot. This is a stunning piece of kit from the people that brought you the world famous straightening irons. It cools as fast as it heats and allows for amazing precision without having to be a hair expert. This can also be found at John Lewis here. Regular readers will have figured that I’m not a big Supermarket or Boots 3 for 2 cosmetic buyer, when you’ve worked in the industry for so long, you begin to realise the corners many mass-brands cut, but, although Schwarzkopf lines the shelves, this product in particular deserves to be in the finest beauty halls and luxury hair salons. It dries quickly and keeps a great matte hold, but not so matte that it no longer reflects any light, but not plastic-y either. The hold itself is immense, I mean Elnett can kiss it’s rear end, and it brushes out amazingly as well, allowing you to style, restyle and restyle again. I’m on my second bottle and if this ever gets discontinued, you’re going to have one very angry man on your hands. You can get your hands on this at Boots here. With all this new styling and prepping I’ve been doing thanks to the likes of the brands above, I have noticed my hair is beginning to dry out a little more, so Moroccanoil Volumising Shampoo and Conditioner courtesy of Fabriah.com has been amazing at restoring it’s thickness and lustre… before I totally destroy it again. But seriously, I have found that my hair looks, feels and well, is, a lot healthier. It smells amazing and is laced with the beautiful argon oil and other concoctions that form the original Moroccanoil. Pick these up at Fabriah here. SK-II Cleansing Oil is a great and easy way to de-grime at the end of the day. Massage it into dry skin and then rinse away with water, it’s so easy it’s untrue. It uses lock and lift technology that really binds dirt to it and lifts it all out as soon as you rinse. It’s great when you’re tired and ready for bed and can’t be bothered waking yourself up for a great big washing performance, whilst actually doing a better job than almost anyone of my foaming cleansers. This is actually exclusive to Harrods here. Ormonde Man really breaks away from the traditional men’s fragrances which I’m sure you know can be very repetitive and boring. Instead you are treated to this wonderful cloud of cardamom and cedar, entranced and infused with bergamot, pink pepper and Juniper. As you can imagine, it holds it’s masculinity, but is confident enough to say, I also appreciate a few lighter and more delicate notes. Underneath all this is sandalwood, oude, vetiver musk and Linda’s signature – hemlock. I really don’t believe that anyone could be powerful enough to resist the tempting allure of this stunning creation. You can buy this direct from Ormonde Jayne here. This article first appeared on MANFACE written by Thom Watson. It was published on Friday 26th October 2012 and was last updated on Monday 3rd April 2017 at 4:07pm. It's categorised under Aveda, Brand, GHD, Hairbond, Moroccanoil, Ormonde Jayne where you'll find more related content.